I’m a Licensed Psychologist in Minnesota and I have a Master’s Degree in Counseling Psychology and a PhD in Social Sciences (Queer Studies & Cultural Studies). I’m a Minnesota Board of Behavioral Health Therapy Approved Supervisor. Here’s my CV if you’re into that: (click here for my CV). My therapy practice is in the Uptown neighborhood of Minneapolis, Minnesota, just a couple of blocks from Lake Bde Maka Ska. Here are some pictures of my office. I work with youth, families, and relationships. I am #YourQueerTherapist— I see queer, trans, and non-binary youth and adults. I’ve also been called “a therapist’s therapist”—if you do this work, you want someone who knows this work. 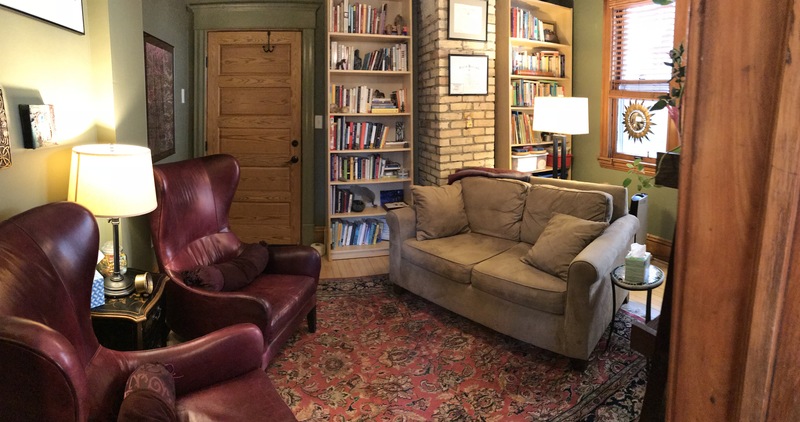 And, I provide clinical supervision and consultation to therapists who want to get really good at culturally responsive, relationally engaged, accountable practice. Since 1985, I’ve worked in settings ranging from psychiatric hospitals to community health clinics, private practice to residential treatment, university counseling centers to youth shelters. I’ve been on my own in private practice since 2002. I also do clinical supervision and consultation with a variety of individuals and agencies that are interested in cultivating socially just, effective, culturally responsive practices. As a therapist, supervisor, and trainer, I strive to provide responsive, creative, and effective services in respectful and engaging ways. The Minnesota Association for Marriage & Family Therapy thinks I do ok—in 2011 they gave me their Distinguished Service Award. I provide training to a variety of agencies, therapists, and youth workers. I focus as on how I do trainings as much as on what I teach about—I favor an interactive, experiential teaching style and I work to integrate theory, practice, and research in accessible and meaningful ways. If you’re imagining a super boring, all-work-no-play life, think again! I have a life not centered on therapy, youthwork, and critical theory. I’m into Gopher Women’s Hockey, drinking cold press, throwing balls for my dog, Feet, walking & biking everywhere, and hanging out at coffee shops (drinking cold press). I have successfully introduced the Nut Goodie—the modest Minnesota candy bar—to enthusiastically receptive international audiences. The Sorting Hat has decisively placed me in the House of Ravenclaw. Believe me—I can talk a lot of dense theory and carry on about a lot of big effing ideas— but that’s not what you’re here for, and this isn’t about me, it’s about you and your life. It’s my job to *get* you and respond to you on your terms, in your terms. Check out the information on my website and give me a call for a free 15-minute phone consultation or to schedule if it feels like a good fit.